TTE O&M in Support of the Stress Management Campaign launched by Abu Dhabi Occupational Safety and Health Center (OHSAD) has selected “Stress Management”- Don’t let stress control you’ as the main theme of this year’s World Day for Safety & Health at Work celebrations. Prior to the celebration a “Spot the Hazard and Scrambled word puzzle competition” contest was conducted among the employees. One poster showing several hazards and another Safety word scrambled puzzle were circulated to all employees. 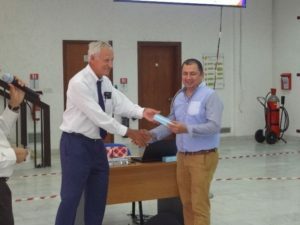 The task was to identify all hazards and match each hazard identified with the applicable “Total Golden Rules” and Engie “Our Saving Life Rules”. For the Safety word puzzle contest unscrambled the letters to identify the Health and Safety words. A fair amount of response received from employees. The program commenced with an introduction of the day’s proceedings by master of ceremony Ms.Manal Al Qaisi, EHS officer, HSE department. Program started with the speech of Mr. Patrick Autran TTEOM General Manager. First he appreciated employees for successful completion of Year 2015/2016 winter maintenance period without LTI except for the one first aid case incident and the Medical treatment case. He said that “Safety also means quality” i.e. quality of communication, preparation and quality of work. He also mentioned that today we also celebrate Successful NDCT. Safety must stay a permanent concern for everyone. Improving Safety is continuous process, and we have a lot of room for improvement. Later he stressed that safety is our top priority, and advised the employees to be proactive always, Step up and report anomalies and watch your co-workers. 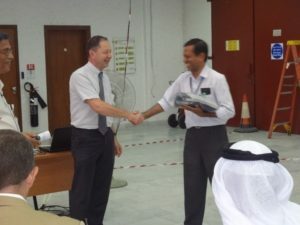 Mr. Frederic Henning, GTTP Executive Manager appreciated TTEOM’s employees for successful completion of Year 2015 without LTI or any major incidents. 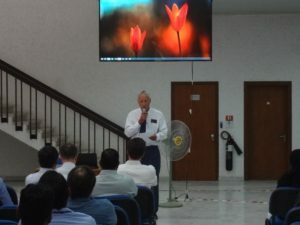 He applauded the good understanding of tasks, planning, and communication and hard work exhibited during the challenging time. He emphasized the importance of strict compliance to the rule in preventing occupational accidents. The basic rules that everyone should know and apply should be clearly explained. Good safety rules can never be taken for granted. 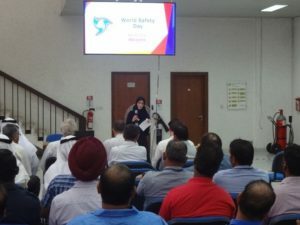 For the Behavioral based safety program he said that “I understand that it has brought in marked improvement in the way people see safety in the day to day activities, however the momentum needs to be maintained and we have to achieve further improvement. Later he advised all that whatever you do whether it is at the workplace, leisure or at home due priority shall be given to Health, safety and environment. Mr. P. B. Raphi Ahmed, HSE Manager, gave a presentation on the main theme topic promoted by OSHAD “Stress Management” – “Don’t let stress control you”. He explained the meaning of stress, level of stress and global statistics of the stress. He explained that “Stress is a natural physical response to any situation that makes us feel threatened. He said that employees typically experience stress when the demands of their job are greater than their capacity to cope with them. He explained the effects of the workplace stress is that, the stress is not a disease, but a state. However, people suffering from work related stress can go on to develop serious health and psychosocial problems. So it is important to identify the signs and tackle the causes of stress before they develop into a serious problem. He also discussed about TTEOM’s HSE performance from Jan-March 2016. 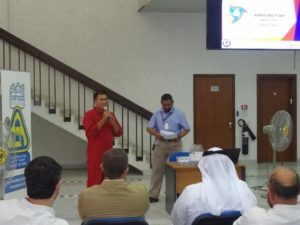 He also gave a presentation on the safe work observation or fresh eye observations and the advantage thereof of fresh eye program: that is – Increases the awareness of risk, increases discussion about safety and improving the consistency of approach. He also explained that “Fresh eye observation is a fact finding process not fault finding. Recording observation takes only 10 minutes to discuss and 5 minutes to feed back. At the end gifts were given those who completed regularly 2 Fresh eye observations monthly. 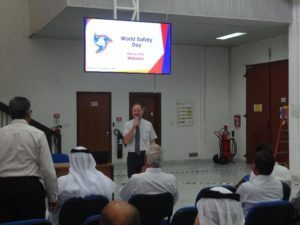 In order to maintain the lively atmosphere throughout the world safety day program short quiz sessions were introduced in between the presentations. The quiz was conducted by Mr. James and Mr. Gerry Dela Torre. Quiz was very informative and gifts were distributed to the winners. 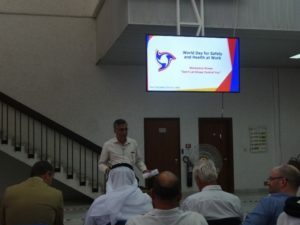 A presentation on the ENGIE Company safety rules was given by Richard Maddock,Engie Safety Rule Officer. He explained about the safe system of work and the regional issues that leads to Near misses and Incidents. He also explained the advantages of implementing a proven system like ENGIE safety rules and also the advantages of having a common system throughout all the ENGIE plants and in particular in all the plants in the region. Mr. James presented “Spot the Hazards and Scrambled word” contest results and discussed the hazard associated to each situation of the posters. 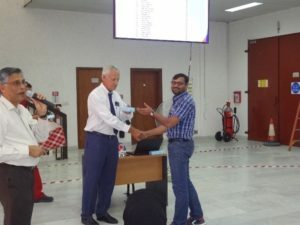 All the participants were declared winners who identified maximum no of hazards and rightly identified the applicable Total Golden Rules and ENGIE “Our life saving Rules”. Gifts were awarded through draw among 12 no of lucky draw winners. 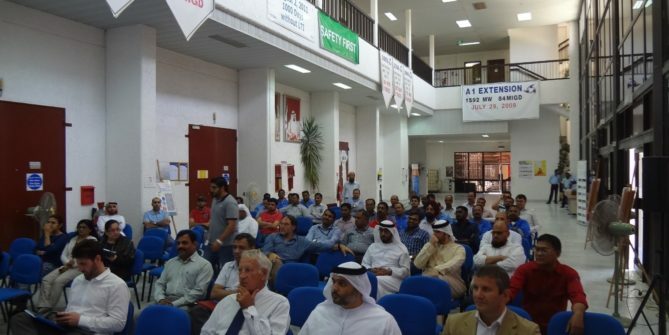 The program concluded with the vote of thanks from Mrs. Manal and lunch was served to all employees.